We have develop a “Trade-with-Mexico” program, for OVERSEAS EXPORTERS or WEB SITE Sellers, interested in developing new business with Mexican market or even better to offer to actual customers an add value service. 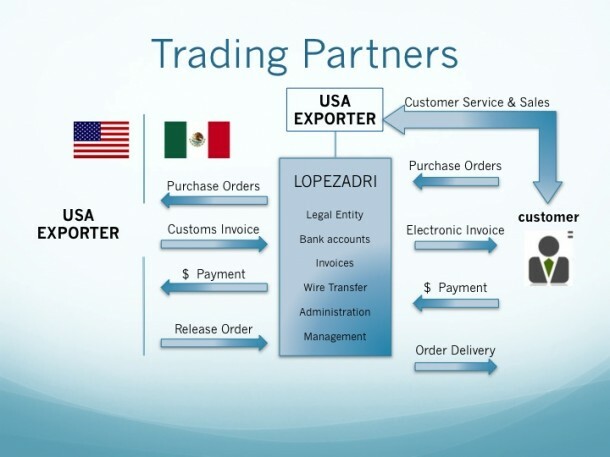 It is a DOOR TO DOOR trading service which consists in SELLING and INVOICING in MEXICO through our Legal entity, LOPEZADRI DISTRIBUCION S DE RL, an importer and trading company, that enables our PARTNERS to use our Legal platform to export directly and sale to Mexican customers as a domestic transactions. Traditional exporters are limited to sale only at the border or at any port of entry in Mexico, but with “Trade with Mexico” program, our partners are able to place orders at any place within the country and much better to have access to non-importers customers.